Real estate is an industry built on inter-professional networking The first few months of a new agent’s career will be the hardest; each up-and-coming realtor will need to prove to potential clients and colleagues alike that they can handle whatever comes their way. Selling real estate is all about knowing enough buyers and sellers in your market – and without those connections, new agents can feel address. Development requires an in-depth understanding of the local area that only comes through networking with those in the know. When investing in an area, knowing the lay of the land is the key to creating success. 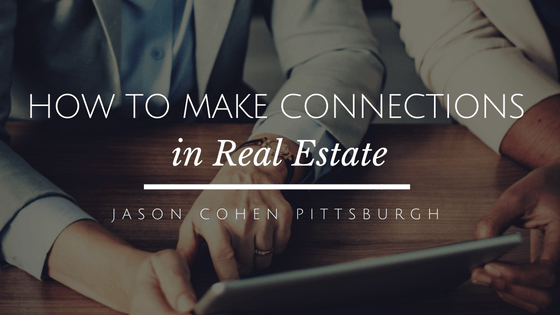 Here, Jason Cohen Pittsburgh offers a few insights into how new agents can make the connections they need to secure their footing in the industry. Real estate centers on the community. Being part of the fabric of your area, be it a town or neighborhood, makes real estate people valuable and known, which results in business success. There are many ways to get involved, including local sponsorships, volunteer work, school career days, local public radio, and local business partnerships. Success in real estate takes time because building a network takes time. Once a real estate professional establishes herself in an area, business begins to naturally flow way her way, and all that networking pays off handsomely. Getting to know real estate pros who are not direct competition makes a big difference. These complementary businesses provide a great source of referrals, something that works both ways. In the digital world, an online presence has become the new first impression. Most all homebuyers get the impression about a real estate business from its website. Fresh blog posts are important for driving traffic. High-res photos create great property impressions. Also, include high-res photos of the geographic area that show its unique and appealing character. Social media provides an instant venue for connecting with clients and sharing knowledge and expertise. Facebook, Twitter, Instagram, and other social media outlets are fantastic places to exhibit property listings. In addition, sharing real estate advice helps build name recognition. By responding to social media posts and inquiries promptly and creating a unique, non-salesy voice, real estate professionals build a solid reputation. Conferences and local events provide the necessary connections within the real estate industry. Once connected in the local area, real estate pros should expand outwards. It’s also important to maintain connections. Regularly meeting for coffee, golf, or drinks keeps things more social.